Wow! Finally, you've decided to get a sit down quilting machine for yourself. That's amazing. Let me cover a few pointers to help with your decision. In summary, Tin Lizzie 18 is the best sit down long arm quilting machine. Because of its affordable price and fantastic quilting capabilities. What's a sit down quilting machine? A sit-down machine is a machine that remains stationary. You move your fabric to quilt. Nowadays, though, there is a trend to use the frame method on these machines. The frame method involves placing your quilt on rails. The material rolls as you quilt. So, you don't have to grapple with the heavy material at the same time as you're trying to quilt. These machines are a boon for hobbyists. Most home sewing machines have a small throat space. So, it's hard creating large quilts. But, that's not a problem with sit downs. Their larger throat space places few limits on what you create. Here are our recommendations for the best sit down quilting machines. It is an advanced version of Lizzie and has an 18-inch long throat. A perfect blend of power, weight, speed, and sturdiness. 1. An 18"x 6” throat to cater for large and bulky quilts. 2. The needle up/down function so you can auto-drop the needle anywhere on the quilt. 3. Built-in bobbin winding that is a real time saver. The M-sized large bobbin suits the bigger project. You don't have to change the bobbins as often. 4. A collapsible table for easy storage. 5. An adjustable lamp for the precision lighting of your work area. 7. An oil reservoir that automatically takes care of lubricant needs. So, there's less effort required over time. Tin Lizzie 18 is a sturdy machine. It is the perfect quilting machine for hobbyists. Tin Lizzie 18 is a clear winner because of its benefits and price. It has a top speed of 2200 stitches per minute. You can adjust the speed to suit your requirements. It is ideal for people who are into free-style designing. People who can't face the restrictions of computer-aided designs. All the machines come with a hand wheel. But what’s unique about this model is its ergonomic positioning on the head of the machine. It makes for quick access. And you can drop the needle at your chosen place on your quilt with ease. The needle will automatically stop in either the up or the down position. You don't have to use the hand wheel. It's your choice. Set your preference via a button or the touch screen and it's good to go. While quilting, cutting the thread at the middle of the quilt can be a daunting task. With the Juki, it's a push of the button, and it cuts for you. You can also set the auto thread lock to secure the stitches. Make sure the machine can power through your most bulky and heaviest materials. Is there enough throat space to maneuver your fabric with ease? Finding a machine with a space of 20-24-inches should see you right. That size is way larger than you find with domestic sewing machines which max out at 7-8-inches. A domestic sewing machine can stitch up to 1,500 stitches per minute. Sit-downs' reach around 2,200 stitches per minute. At this speed, they still handle thick layers of fabric. Without the needle breaking or the feed dog seizing. Compared to sit down machines home sewing machines’ needles break more frequently when quilting. Also, it is harder to position needles accurately. But, with the sit down machines, you can drop the needle anywhere on the quilt exactly where you want to. With domestic machines, it's best to follow the sides and seams. Because domestic needles don't always pass through the bends and layers of the fabric. You don't experience this problem with sit down machines. In some sit-down quilting machines, needles are positioned and attached to circuit boards. It avoids many needle breakages. The needles turn quickly once the cycle has started. It means strong and precise quilting. Many of the home sewing machines lack stitch regulators which leads to an uneven stitch. Good quality sit down quilting machines come with stitch regulators. They adjust the needle speed to produce even stitches. You get regular even stitches on bends, designs, circles, and corners of a quilt. Don't go for these machines. They won't do the job. You'll be disappointed with the quality even if you complete your project. These machines cannot match the perfection you get with a sit down machines. Industrial machines are powerful, but you can't maneuver your fabric as easily as with a sit down. Some feed dogs in industrial grade machines can also scratch fabric while quilting. If you are a serious quilter, buy a specialty quilting machine. You'll produce a better quilt than with a quality but all-purpose industrial machine. There is no harm in shopping online. If you are getting a great deal then why not. But, don't make the mistake of buying without trying. Make sure you check out a machine at an offline store, machine fair or exhibition. Even better, attend a workshop to give it a thorough tryout. One of the most common mistakes made by consumers is rushing towards cheap deals. Going for a deal that looks lucrative but compromises on quality and is a lower end market brand is not wise. Quality machines are expensive. Sometimes the cost is up to $8000. So, expect to pay more because you get what you pay for. 1. Remember to adjust tension settings to suit the requirements of your project. 2. Always test the fabric layers to make sure you will be able to produce the design of your quilt. Designs need arm movement and fabric movements. Testing a design on a scrap will help you in avoiding mistakes on the final project. All the machines reviewed are excellent choices for advanced and skilled quilters. 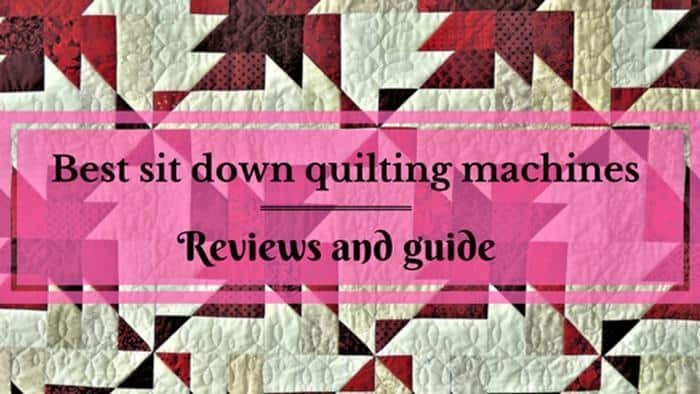 So, if you are new to quilting, I would recommend you start off with a domestic arm machine. Then work your way up to a sit down machine. Later you will be able to convert it to a “stand-up/frame” system. Make sure you visit quilt shows to test machines. Based on your tests and our reviews you'll be able to pick the machine that's best for you. Happy quilting!